A Further Analysis of the American Investigation into the Dutch Referendum "Vanuit eigen perspectief"
The European Union has been negotiating for years to establish membership status for the Ukraine. The most recent step in this trajectory is the closing of an Association Treaty with the Ukraine. The refusal to sign this deal, because a better one was offered by Russia, led to the Civil War that is now raging in the Ukraine, as well as the secession of the Crimea from Ukraine and it’s subsequent integration into it’s historic Motherland of Russia. A new Referendum Law, enacted on July 1st 2015 creates the possibility for Dutch citizens to oppose any measure by the central government if certain requirements are met. These requirements were met in October of 2015 and the Referendum on this highly disputed Association Treaty became a reality. This did not sit well with Dutch politicians who starten, en masse, denouncing it. Soon, as of today still, unfounded allegations were brought that the parties involved in opposing the ratification were, somehow, sponsored by ‘the Russians’. It is from this perspective that this subsequent analysis is done. For more explanation read: The Russians are coming! On January 16th the Telegraph published an article in which it was suggested that the American Congress ordered National Intelligence Director James Clapper to investigate Russian influence in European countries, which also would have influenced the Dutch Referendum on the 6th of April. This research appears to be a political one. Further research appears to confirm this suspicion. Following a new timeline and already publicly available information we reconstruct this investigation ordered by Congress and the supposed Russian influence in the Dutch referendum. First we’ll examine the timeline, than the Telegraph article after which a statement of facts is made. Subsequently we’ll be able to conclude with a high degree of confidence that the article bears a political message in it. Let’s start with the timeline to get a grasp on reality. April 22 2015: Dutch Intelligence Agency (AIVD) publishes its annual report on the year 2014, noting and warning about an increasing presence of Russian intelligence gathering in the Netherlands and actions against Dutch citizens in Russia. June 1 2015: Representative Nunes (R-CA) introduces H.R. 2596 as the Intelligence Authorization Act for Fiscal Year 2016 in the House of Representatives. June 7 2015: The New York Times publishes an article on the influence that Russia is (semi-)openly exerting in Europe, partly, as a result of the sanctions put in place by the EU and the concerns that raises for the political stability of the EU and its consequences for NATO. His own experience in conversations with people in Europe and NATO on Russian influence in former Soviet-states and the EU, specifically its consequences for NATO. June 16 2015: H.R. 2596 is passed and is sent to the Senate where it becomes S. 1705, but is not acted upon. July 1 2015: The new Dutch Referendum Law comes into force. This enables citizens, who gather over 300.000 valid signatures to postpone the entry into force of a law that is not exempted of this procedure. If the 300.000 signatures are met, than a Referendum has to be held in which the whole of the eligible population gets to vote on the law. It is not a binding referendum. October 14 2015: The Election Council declares there to be 427.939 valid signatures and thus a referendum on the Association Treaty with the Ukraine will be held. December 1 2015: H.R. 4127 passes and moves on to the Senate. Again the proposal is not acted upon. December 18 2015: H.R. 2029, titled Consolidated Appropriations Act, 2016, is passed in the Senate with, met H.R. 4127 attached to it as Division M. The same day it signed by President Obama and Congress goes on a Break. Januari 11 2016: Congress returns from its Break. Januari 16 2016: The Telegraph reports that a major investigation will be carried out into Russian medling in Europe. Specifically the Dutch Referendum is mentioned, because its arguments resemble known Russian propaganda. Soon after this news, Dutch media follow suit and reported on the investigation into the Referendum. This reflects what Dutch media reported. It means the research has not yet been carried out. But also it is only half of what the investigation entails. Because, this leaves out the former Soviet-states and the fact that the investigation will go back almost a decade. Whatever influence that might have, no investigation has been conducted yet. If that is so, where than does the rest of the information that the Telegraph provides come from? It is suggested that there are some dossiers and investigations already done. That is a possibility. In any case it is now known that most of the information stated by the Telegraph was already public knowledge for at least half a year. The Telegraph reports, despite the investigation by National Intelligence is not yet conducted, that several countries and organisations will be investigated and far right organisations such as Jobbik in Hungary or Front National in France will be investigated. Interestingly, Representative Turner let us know on June 8th that this knowledge is not as secretive as the Telegraph appears it to make. As stated in the Timeline (see above) Representative Turner stated a twofold reason for his amendment ordering this investigation. His first reason is this article in the New York Times on June 7th. Interestingly it is of note that much of what the Telegraph ascribes to uknown government officials is openly discussed in this New York Times article. Furthermore, that article is much more detailed, it names more instances, parties and is much more specific. For linguistic researchers dealing with ancient texts, such a level of refinement in stories that seem alike is usually an indicator that the more precise story is the, or closer to the, primary source of the story. This is not to say that the journalists at The Telegraph just blatantly rewrote the New York Times article. It does show however that the information that appears so secretive is a) not secretive and b) already was publicly known in june 2015 and even led to the creation of the very investigation The Telegraph is now writing about. Therefore there appears to be little reason to obfuscate the information that is provided. When the Amendment by Representative Turner was adopted on June 9th, the Dutch Referendum Law was not even enacted. The whole business of this Referendum did simply not exist. At the re-introduction of H.R. 2596 as H.R. 4127 on November 30th, no discussion on the contents of the proposal is to be found, at least no discussion in which the Referendum in the Netherlands is mentioned. Strictly speaking this means that only organisations who are financed, overtly or covertly, by Russian Security Services are to be examined. And most of those flows of money are already publicly known, thanks to the New York Times article. 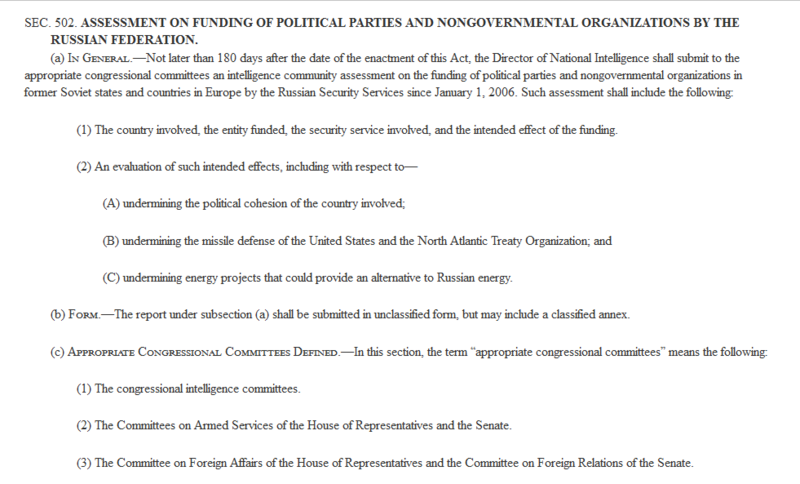 However, the Russian influence, according to its order by Congress is defined by flows of money, not arguments. If Russian propaganda was to be used by the Dutch pro-side, than this would only be relevant if it the investigation by National Intelligence proves there is Russian influence in the form of money. However, The Telegraph states the investigation is going to be carried out, therefore nothing of the sorts that is suggested here can be backed up by evidence from an investigation. By embedding these remarks into the broader context of the article it is suggested that the Dutch pro-side of the Referendum can command Russian money to aid in its cause. The article continues noting a similar concern is raised towards the Brexit-referendum. The suggestion that a dossier of Russian activity in the Netherlands exists may very well be true. Even the Dutch Intelligence Agency (AIVD) reported on this in its Annual Report on the year 2014, which was published late April 2015. They explicitly warned about the growing activities of Russian intelligence in the Netherlands. These concerns are similar to those of the New York Times and Representative Turner. So there appears to be little cause for the air of secrecy that emanates from the Telegraph article. Precisely because of the public nature of much of the presented information very little objective reasons could be thought of for these suggestive remarks. The main point however is that the Telegraph mentions specifically that in the dossier, only seen by them, the argumentation of the pro-side closely resembles Russian propaganda, while Congress explicitly notes that it wants to have the flows of money from Russia examined. As the Telegraph stated, the investigation has not taken place yet. That receiving sums of money can change one’s opinion is true. That people would be willing to change their tone for sums of money is also true. However, without those flows of money from Russia as tangible evidence the link that the Telegraph makes is baseless. Especially because the information mentioned from ‘the dossier’ consists mostly from already publicly known information. This means ‘the dossier’ and the investigation ordered by Congress are two different matters. Despite this, the unfounded suggestion is put before the audience of the Telegraph that ordinary decent people in the Netherlands are taking Russian money to destabilise their own country. Only because arguments resemble other arguments. 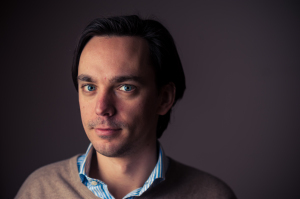 The Dutch Referendum on April 6th cannot be target of the investigation to be conducted by National Intelligence, simply because on June 8th 2015 when this investigation was added as an Amendment to the Intelligence Authorization Act for Fiscal Year 2016 there was not even talk of a Referendum in the Netherlands. The focus of the investigation by National Intelligence is on flows of money by Russian Security Services from 2006 onward in former Soviet-states and European nations. The only new part in the Telegraph article is the, purported, close resemblance to Russian propaganda of the arguments, arguments of the pro-side in the Dutch upcoming Referendum. However, this statement is made without revealing a source or providing examples. The same concerns are raised regarding the Brexit-referendum. Until such time as examples are given, these statements remain suggestive utterances that cannot be verified. Furthermore, without the investigation by National Intelligence it is not possible to say what the Telegraph so suggestively put in front of its unsuspecting audience. Now that we have seen that the investigation by National Intelligence is much wider than only European nations and that it will go as far back as 2006, we can conclude the focus of the investigation will not be the Referendum in the Netherlands or in the United Kingdom. With these facts in mind, we can take closer look at some grounds for placing the information in the way that it has been by the Telegraph. We are immediately tempted to do this within the context of contemporary politics. There reason for this is the Gleichschaltung of the pro-arguments with Russian propaganda, without any content to back up such a claim. As long as that dossier is not publicly available, this appears to be a guilt-by-association technique. For, who wants to be deceived by people who use Russian propaganda? Such a tactic usually has the goal of influencing one’s thoughts on a certain matter. No one wants to be associated with the bad guy in life. The result of such a technique is that people will consider their own reputations before association themselves with the targeted group even more than they would otherwise do. This would mean that less people would put their labour into the support of the pro-side of the Referendum in the Netherlands. Simply because they do not want to be associated with people of whom they have read that they, reportedly, receive money from ‘the Russians’ to destabilise the whole country. That brings us to the old Roman phrase: Qui bono? Who benefits? They referendum in both the United Kingdom and the Netherlands are contrary to what the EU tries to achieve. In the UK it is about staying or leaving the EU and in the Netherlands it is about trying to have the government reconsider their position on the Association Treaty with the Ukraine. As a matter of fact the sentiment in the Netherlands points in favour of a rejection of the Association Treaty. The largest research to date was conducted by 1Vandaag. Over 27.000 Dutch voters responded. 53% would definitively go and vote with a further 17% most likely to go vote on the 6th of April. Of these percentages 51% would definitely vote in favour of rejection of the Association Treaty with a further 23% most likely voting in favour of rejection. A recent poll by Survation shows that those in favour of Brexit hold on to their lead while those who doubt are mainly former no-voters. A majority in favour of rejecting the Association Treaty in the Netherlands will lead to political instability during the Dutch presidency of the EU. The current government will lose its credibility if they ignore such a vote. A Brexit, is likewise disastrous, because it shows peoples all over Europe that the EU is not an inevitable ever closer union. It is uncertain what forces will be empowered on an national level. Political instability of the EU will not arise from its people having a democratic say in further expansion or its membership. However it is also not hard to imagine that these contrary popular movements, those who want to turn away from an ever closer union, could contribute to weakening the EU-bloc as a whole. This is so because political reality will force politicians to listen to their voters or risk losing popular support. That is not to say that popular support is to be the basis of government alone. But in reality that has becoming more and more important for the last decades. From an EU-perspective these developments in member-states are a threat to the stability of the Union as a whole, while it is a democratic event for the nation itself. It is this danger, from an EU-perspective, that is being investigated by Congress, but only in places that are prone to Russian influences, mainly in the past. The suggestion that democratic referenda are bought by the Russians remains completely unsubstantiated. The research ordered by Congress is not aimed at the arguments of the Dutch referendum. It is aimed at the flows of money that can be traced to the Russian Security Services in former Soviet-states and European nations, from 2006 until today. The information presented by the Telegraph uses mainly previously publicly accessible information. The only new part is about a similarity in arguments in the Dutch referendum with known Russian propaganda. This accusation is done without any explanation, example or mentioning of sources. The only source is a dossier that no one has yet seen, except for the Telegraph. The suggestion that is put in front of the audience of the Telegraph is that the pro-side of the Dutch Referendum, and by implication the Brexit-referendum, is using Russian money to further its arguments and propaganda. This is done without any proof and thus functions as a technique called guilt-by-association. This observation can be placed in the trend in both the Netherlands and the UK concerning both their Referenda. In the Netherlands the trend favours a rejection of the ratification of the Association Treaty with the Ukraine and in the UK those who vote in favour of Brexit are leading the polls since September 2015. This development is evidently not in the interests of the EU. It can be safely observed that the suggestive writing in the Telegraph supports that interest. With these conclusions the article in the Telegraph appears to be steering the public debate in a secretive manner. That however does not lead to the conclusion that its authors are doing so deliberately. However, the impression that arises from this analysis, that this article is EU-interest drive to have us all look in the same direction, can as of now not be discarded. If this analysis is correct, than it is highly disappointing to see that these important democratic questions of our time are deemed, even by members of the Press, as a handle for sowing mistrust and rumours. On an interesting side-note. American billionaire and investor George Soros is actually providing funding for the side that wants to persuade Dutch voters to ratify the Association Treaty with Ukraine. He invested more than $ 215,000.- or an amount equal to €200.000,- into the Yes-campaign. At the same time he has a vested interest in the state of affairs in Ukraine. This is precisely the kind of meddling in our internal affairs that was part of the agenda of those who oppose this agreement and is likely to be a severe blow to the opponents of national sovereignty that want the Association Treaty to be ratified. Next Post Stiekem zijn we allemaal mensen. Al eeuwen.